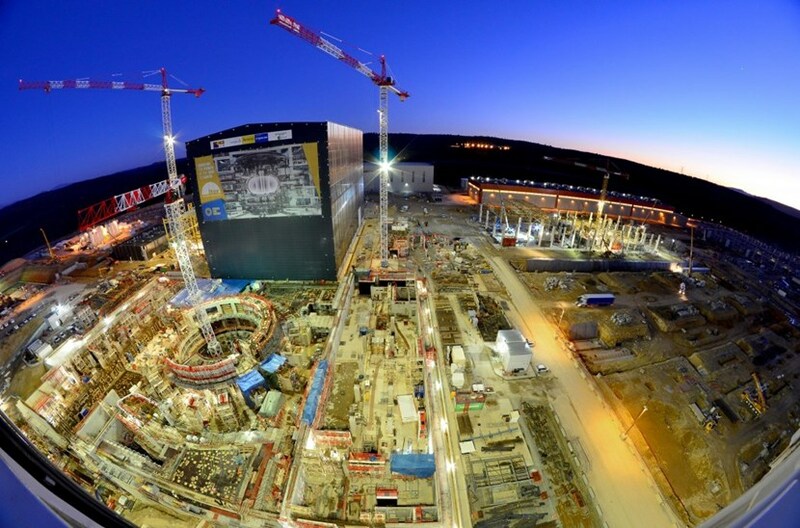 As dusk settles on the ITER worksite, the second shift is only half way through its workday. Lights turn on, illuminating a spectacular scene teeming with activity. To the right of the image, the view takes in the red-trimmed Poloidal Field Coils Winding Facility where fabrication is ongoing for the mockup of poloidal field coil #5. Standing parallel to this large industrial facility, the cryoplant's foundation and supporting columns are now finalized and the first elements of its steel structure are in place. To the center left, the Assembly Hall has acquired a towering presence—something akin to the Kaaba in Mecca. In the harsh worksite lights, every detail of the ongoing works in the Tokamak Complex stands out: the almost completed L1 level of the Diagnostics Building to the right; the blue tarp covering the most recent concrete pours in the Tokamak Building at the centre and the thousands of embedded plates, formwork structures and penetrations in the Tritium Building to the left. Turning to the north now, and to the snow-capped mountains catching the last of the sun's rays—a different, unusual vision of the ITER site: to the left, lights are on in the offices of ITER Organization Headquarters as they are now in the villages in the distance. And here is the Holy of Holies—the circular fortress that will enclose the ITER Tokamak and its 3.2-metre-thick rampart, the bioshield. 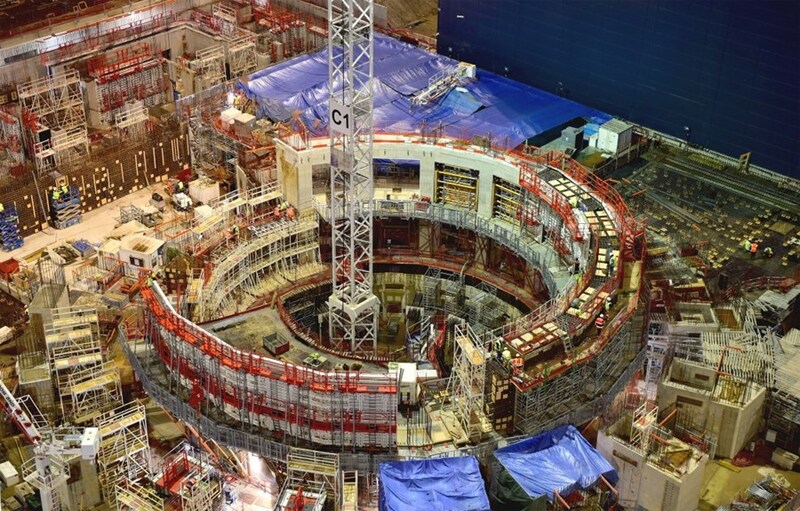 The structure, made of super-heavy concrete, is designed to protect both men and the environment from the radiation stemming from the fusion reactions inside the machine. In some areas of the L1 level, concrete is already settling and drying; in others, formwork and reinforcement is in place for the upcoming pours. 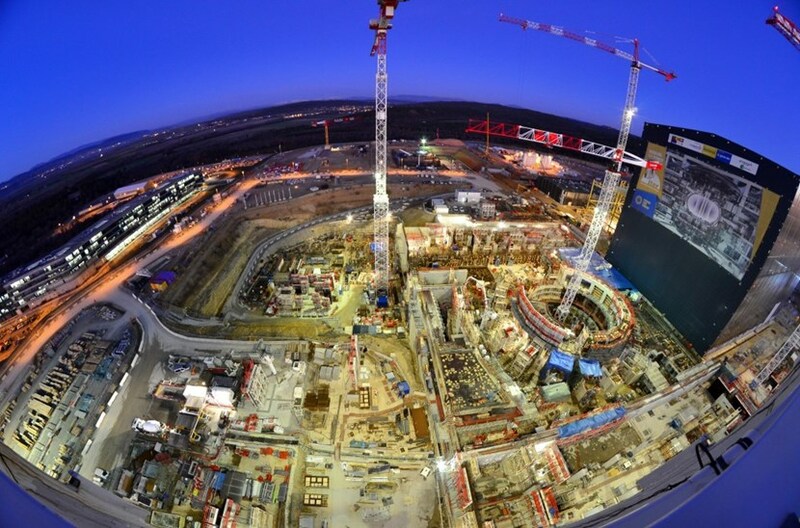 There's a striking beauty in the ITER site at night—something that fills with awe and anticipation.